Louis Cheskin wrote books about color, market research, advertising, package design, and product development during the 1950’s. He was a fervent advocate of diligent and objective research with a focus on unconscious testing for the purpose of discovering deep motivations. Acknowledging the irrational elements of human behavior, he brought psychoanalysis and Gestalt theory to marketing. Cheskin gained fame for predicting the failure of the Edsel and berated researchers and executives who failed to use market research to drive product development and go to market strategies. 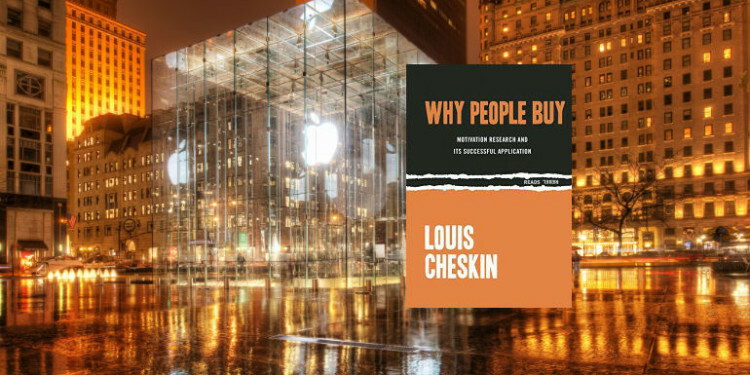 In Why People Buy , Cheskin presents his insights into human motivation as expressed in purchasing decisions. Research techniques for measuring what motivates shoppers were developed outside of the marketing field. Purchase behavior is psychological. Motivations of shoppers are not totally or even basically rational, and, therefore, the normal, direct procedures for measuring objective factors are not valid. This is one of Cheskin’s core principles: bringing psychological insights to bear on market research to discover the motivations that can indicate acceptance and value of brands, which, along with packaging, are the bearers of meaning for products. It is by investigating these deep connections individually and as a whole that marketers can effectively position products for sale. Research techniques showed companies that selling “security in old age” and “security for family” are more effective than simply selling an insurance policy. We are not motivated by the functional or practical aspects of a product; it is the emotional appeal that works best. Research shows that brand-identifying image is a vital part of every effective package. It is the focal point. It is a brand-identifying device. It has symbolic meaning. Ideas are what attract and initially sell products. Selling the concept of “beauty” or “purity” is more effective than a cosmetic or soap. Cheskin is adamant that nothing can overcome a bad product; however, the initial image is the gateway to the sale. His emphasis on unconscious level testing, eye tracking, and close examination of packaging elements are ways to see beyond the surface impressions. Because people are not always conscious of their motivations, asking them what they prefer will result in false findings, and simply repeating messages to them will not result in increased sales. He notes that “the product, the package the advertising and the pricing must be coordinated into one image, a single entity and into a unified effect.” Cheskin returns to branding frequently, because it is the brand that expresses all the ideas and values behind the product and the company. The brand is the guidepost to consumers who don’t know much about the product. The same psychological turmoil that rules our lives is evident in purchases. Multiple wants, needs, and desires wage war within us as we struggle to make decisions in the store. There is no rational process which slowly and deliberately leads us to our destination. Cheskin sought to bring psychology and sociology together in the study of motivation. He said: “man is both libidinous and social.” By this he meant that we act equally out of our physical desires as well as to fit in with groups and align with broader society. We are subject to internal and external motivating forces. Cheskin believed that evaluating both these powers brought about the deepest understanding of motivations. Individuals may be attracted to either pole, becoming “inner-directed” or “outer-directed”. A third dimension is also possible: “social-directed”. Someone who is “social-directed” wants to conform and will make choices to meet social expectations. All three motivations are present in each of us, often with a single dominant theme. Marketers need to be aware of these drives and test for them. Cheskin was adamant that nothing could make up for a weak product. If the offering was not strong competitively, no amount of marketing might could drive sustained sales. Marketing makes the first sale, but the product makes the second. A quarter of a century ago, the package was merely a physical container. It was a measuring and handling device. It was designed to protect the product. Under present market conditions, the package is a psychological factor. It is a marketing tool. It is a silent salesman. Packaging is the second to the product in terms of importance because people transfer their perception and evaluation of the package to the product. Again, Cheskin stresses underlying psychological themes. The package is what expresses the brand and the ideas behind the product. Customers read the package unconsciously and make associations based on its contents. Effective packaging has a psychologically meaningful and logotype, images, and color, each of which has been tested individually and as a group. Originality is the designers greatest asset yet he seeks to reach an audience that has been conditioned to old forms. Because people feel secure with the old and the familiar, they resist the original and the new. Although people resist the completely new idea or form, they are also bored or unstimulated by anything that is old and familiar. Research has shown and experience has confirmed that in design, as in most matters, something new about the old has the greatest acceptance, because the new aspect is stimulating and interesting and the old element makes one feel secure and confident. Packaging design is a creative process and involves the creation of many alternatives for testing purposes. Effective package and product design walks the line between the familiar and the futuristic. Henry Dreyfuss calls the strategy of anchoring people in past familiarity survival form. Because these deep needs (stimulation and comfort) are key to success, Cheskin believes research “that probes unconscious motives” can find the right balance between old and new. Most American advertising specialists depend primarily on copy for getting their messages across. Language is their basic means of communication. The prime objective of European producers was to entertain, to amuse, to please. The selling is indirect, subtle, unobtrusive, not overbearing as most American commercials are. Discussing the future of advertising, Cheskin finds that most advertisements will irritate movie goers; however, he finds an interesting alternative in European ads which are longer and more artistic. The theme of connecting images and ideas with the buyer is highlighted. By using imagery and conceptual communication, the European ads resulted not only in a high recall rate, but a positive association in the minds of the buyers. Cheskin advocates a “soft sell” approach over the repetitive, irritating “hard sell” that increases recall, but does not motivate buying behavior. Why People Buy is a fascinating book due to the foresight and varied observations of its author. Writing during the Cold War, Cheskin brought a wide range of perspectives and tools to what was previously an intuitive and subjective field. His findings are still the subject of marketing programs and books on consumer behavior. The first of the book describes his findings about human motivation. The second half focuses on his research methodology and specific findings. As Cheskin covers marketing topics, his insights and themes surface and combine in various examples. This book is difficult to find and expensive on-line, but well worth the read if you have a good library network to draw upon.